→Garmin Approach S60 Review – Possibly the best GPS Watch you can buy. We’ve just got our hands on the new Garmin Approach S60. We’ve been eagerly waiting to test this beauty! And trust us, it doesn't disappoint. The Garmin Approach S60 is the latest (and greatest) GPS watch in the Garmin line and has considerable improvements over the previous model, the Garmin Approach S6. Whilst the previous models in the Garmin line had a sportier look, the S60 has gone in the opposite direction, with a trendy looking GPS watch that will look at home both on and off the course. If you’re looking for the best golf gps watch money can buy, the Garmin Approach S60 could be exactly what you’re looking for, and here’s why. Well, firstly the S60 is a stylish looking watch, it looks more like a smartwatch than the typical sporty looking golf GPS watch. It's easy to see this is a watch designed to be worn both on and off the golf course. The watch has a slight weight to it due to its premium build quality. The touchscreen is bright and responsive. The three buttons are solid and give good feedback when clicked. The Garmin Approach S60 is comfortable to wear and can be customized with QuickFit watchbands that can be interchanged without the need for tools. This is handy as I find myself switching between the stainless steel (when at work) and the silicon (when golfing). The Garmin Approach S60 golf GPS watch has some great features. Not only does it have a full color screen, but it’s also bright enough to see in direct sunlight. It also has a long battery life (10 hours in golf mode and up to 10 days in watch mode) so if you want to stay out for several rounds of golf you'll be able to do so without worrying about the battery running out on you. The S60 weighs only 1.8 ounces so it's not too heavy and has a solid feel to it. 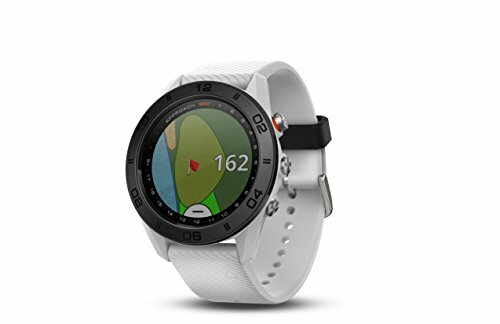 There is a circular screen just like a normal watch which can be customized with custom watch faces and apps from the Connect IQ™ store which supports most of Garmin's newer devices like the Garmin Approach G8. You’ll still be able to operate your watch even if you’re wearing gloves, or in rainy weather. The watch is water-resistant to a depth of 50 meters so there's no risk of damage when raining. There are three buttons on the right side so you can select activities, or move through the menus. The S60 also has a touch screen, which is a lot different than most of Garmin’s other GPS watches, but you’ll be paying a steeper price for this watch. The touch screen enables you to swipe around basic widgets that summarize daily activities, last round played, and even the weather. If you access the golf app from your smart phone it will also have a similar flow of capabilities, from the round summary, to club selection, and distances for each stroke (see video below). Many of you may be hesitant to buy a high-tech product if you think it’s hard to use, but the Garmin Approach S60 is actually intuitive. It does require a bit of setup once you remove it from the packaging, but it should take you less than ten minutes. To begin, you’ll need to follow the onscreen instructions prompting you to download the Garmin Connect app to your smart phone. Next, you create a free account and use a Bluetooth connection to sync your new S60 with your new Garmin Connect account. After you’ve done this, all settings can be controlled from your new golf watch. You’ll first need to start your round of golf as usual. At the beginning of each hole, the display will show you standard yardages to the front, center, and back of the green. It will also display the elevation which is relative to the green, and give you a compass that will point you in the correct direction of the hole which can be useful, especially if you’re making a blind shot. You can also zoom in and out to see hazards and check distances to anywhere. The S60 gives you the option to record each club used. You can also record scores of both yourself and your playing partners. There is even a swing tempo app, but you need to purchase the TruSwing sensor separately. The Garmin Approach S60 is in our opinion, the best golf gps watch available on the market right now. With its great looks and intuitive features it's a must have for those of you who want a great looking, easy to use golf gps watch with great features. Whilst it may take a few rounds before you see any improvement in your play, the Garmin Approach S60 will be a great addition to your game.